Meeting Your Home Furnishing Needs. When it come to decorating your home (whether you are working with a small living space or have a lot of spare room) IKEA has the furniture, decor and accessories for you. I love how they offer different styles for their furnishings from ultra modern to romantic classical. I could easily get lost for hours in their store looking through all their treasures. Every time I go I get more ideas of things I want for my home or to use for future blog posts. In addition to their amazing Home furnishings, they also have the tastiest food. I love taking my kids to eat at their restaurant to eat for lunch. I usually order their Sweedish Meatballs,potatoes, and lingonberry juice and my children love to order their chicken strips and french fries and water. This month (June 2016) IKEA is running a Feeding America Campaign where they are donating $1 from each kid’s meal (or customers can choose to donate) to their LOCAL Food Bank! You can LEARN MORE HERE. 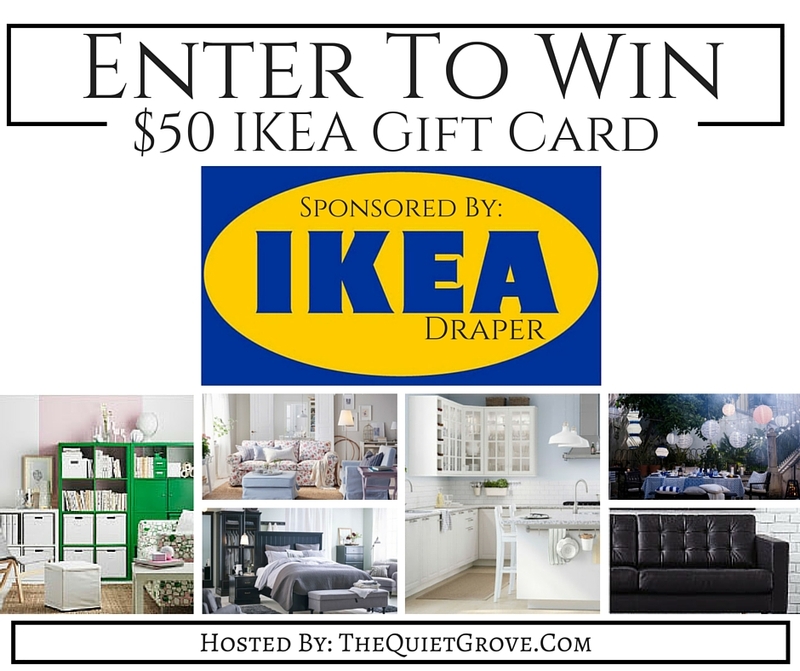 I am so excited to be teaming up with IKEA Draper and TheQuietGrove.Com to offer one lucky winner a $50 IKEA Gift Card! This giveaway is open to US residents 18 and older. Enter using the Rafflecopter widget below. This giveaway starts now and goes until 11:59PM MST Saturday, June 25th. The winner will be chosen randomly and announced Monday, June 27th. Good Luck! ** I can’t ask you to “Like” our pages but, if you see something you like, let us know so we can bring you more of it. Thanks for taking the time to enter this giveaway! Disclosure: This blog is not responsible for prize fulfillment or shipment. I was not compensated to participate in this giveaway. I would put the $50 towards another bookcase. I have several IKEA bookcases and would love more.